Coming to court for a hearing can be a nerve-wracking experience. The most straightforward and non-contentious legal cases can reduce grown men to quivering children. The day of the trial could be the culmination of years of dispute – with everything turning on what might only be a short hearing. The Notice of Hearing tells the parties where and when the claim is due to take place. It may also come with directions to the court and general information about what to expect. Parties must allow themselves plenty of time to get to court and should aim to arrive at least 15 minutes before the hearing of the claim. There is nothing worse than arriving at court sweaty and exhausted, having got lost on the way. Check the court’s location on a map the day before the hearing: a common mistake is for people to go to the magistrates’ court instead of the county court because they assumed they knew where the “court” was. Most courts of justice now require visitors to go through a security check before entering the building. Cameras are not allowed. Although camera phones are tolerated, security staff could insist on holding onto any cameras until the owner leaves. Sometimes the security staff will also take people’s names and ask which hearing they are attending. After security the next step is to find the usher dealing with the case and to sign in. At some courts the ushers will sit behind a desk ready to take people’s names. At other courts the ushers sit in the court-room with the judge and only come out to take names in between hearings. Where there is any doubt about the procedure, or if the usher cannot be found, the list of hearings should be located. This will indicate which judge will deal with the claim and in which court room it is to be heard. The court day is quite limited – theoretically most law courts sit from 10.00 to 4.00 with a one hour break for lunch in the middle. The number of cases can easily exceed the number of hours in the day. 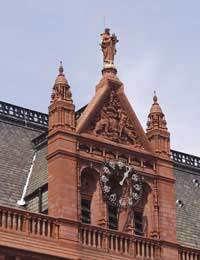 A fairly high proportion of cases which have been listed do not go ahead – they may have to be adjourned or often people simply do not bother to attend. In addition the judge’s time is expensive and he is not meant to sit around waiting for people when he could be carrying out justice. The consequence is that, for most types of cases, the court office may list a number of hearings at the same time – on the assumption that not all of them will go ahead. Therefore, although the Notice of Hearing says that “your case will be heard at 10.00 am” the parties may arrive at court to find that four other small claims trials have also been listed for 10.00 am. Clearly, they cannot not all go ahead at the same time. Unfortunately, engaging with the law involves a lot of waiting around. If the other side turns up it is quite likely that both parties will find themselves sharing a relatively small waiting area. For some this could be the first time they have seen each other since the dispute arose. If a party feels uncomfortable or threatened by the other side they should talk to the usher who will try to arrange for the parties to wait separately. The other side may be legally represented and may not, therefore, attend the court themselves. However, a witness may have attended to give evidence. Sometimes parties will come to court with a number of family members or friends for “moral support”, which the other side may find intimidating. Although small claims trials are public hearings they are often held in relatively small court rooms and the judge is unlikely to want large numbers of people in his room unless they are there to provide evidence. It is usual to talk to the other side, or their representative, before the hearing. Sometimes people are so angry about the case that they do not want to, but it can lead to disputes being resolved. If the other side is legally represented people may find that talking to the lawyer is easier than talking directly to their opponent. If the parties do reach an agreement before going into court they should notify the usher. If the judge knows that the parties are agreed and that the hearing will, therefore, not take long he may deal with it sooner than he had originally intended. I am a defendant in a Small Claims case at County court.With just over 2 weeks to go to the trial, I today received documents and witness statement from the claimant, together with a note that they would not be attending court but would be sending an 'advocate' to represent them.Can they do that?I wanted to use my arguments against the claimant, not their representative.Can I ask for their side of the case to be heard on documents only?On the N180 form the claimant had to send to the court, they left the spaces blank when asked how many witnesses would attend. My Husband was subcontracted to do electrical work.The contractor did not finish the job and wrote off the payment with the house owner.My Husband did not got paid.We took both parties to court as we were unsure who actually owed us the money, we assumed the contractor did.In court the house owner said he had made the contract with my husband and he offered us a third of the money he owes.We were sure the contractor owed us the money and got in a right knot.the judge then adjourned the case until February.Do we accept a third of the money owed as we cannot prove what my husband did or how many hours he worked in 2011.Or has the judge adjourned the case knowing we could build a case up against the house owner and get more money?